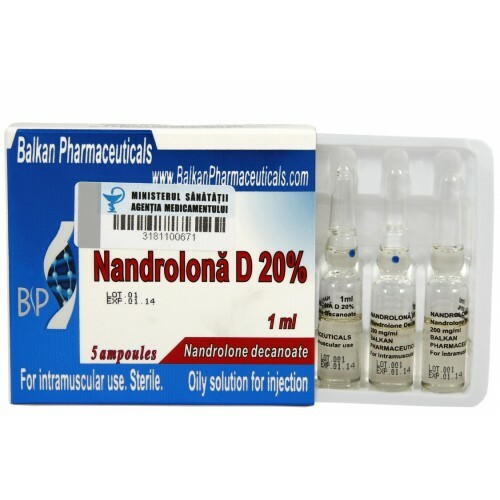 Nandrolona D is one of the most often uses anabolic steroid. Such a popularity is caused by it’s variety of positive properties. Nandrolone Decanoate has a pretty long release period, about 3-4 weeks. It may not be so for single injection, when the release time is about 1-2 weeks, but from multiple injection you can expect to benefit from it’s good effect for a longer duration. The chemical structure of this compound is similar to that of testosterone with minor difference but which makes it much less androgenic then any kind of testosterone. Unlike testosterone, Nandrolona D will break down to a much milder metabolite, dihydronanrolone which is even weaker then nandrolone itself. Thus you shouldn not be afraid of such androgenic side effects like oily skin, body and facial hair, acne. However the androgenic effect can be noticed if Nandrolone Decanoate is used in higher doses. Aromatization with Nandrolona D is very low. This is due to the fact that the liver can convert Nandrolone to estradiol, but in other more active of steroid aromatization sites this compound is less open to this process. Therefore anti-estrogen drugs are not needed unless you are very sensitive individual. Water retention can occur only if used in higher dosages. In this case you can add some proviron or nolvadex to lower this tendency. A major negative side of Nandrolona D is that the metabolites that nandrolone creates are detectable for about a year after use. One of the property of the esterified steroids, including Nandrolone Decanoate, is it’s ability to get stucked in the fatty tissue. After long term use of this compound small amounts can be stored in the fat tissue and released in the blood stream months after use. If the athlete is on a diet his chances to be tested positive for Nandrolona D will considerably increase since body fat is being burned more actively. As all of you probably know, Nandrolone Decanoate is a steroid that will exhibit slow and even gain of quality muscle mass. Bodybuilders should not expect a dramatic increase in muscle with this compound but the gain will still be quite noticeable. Due to it’s mild nature and quite slow action it is more reasonable to use Nandrolona D in longer cycles, lasting from eight to twelve weeks. The average dose is 200-600 mg per week for men. There is also an opinion that in order to get the optimal result from the point of view of gains/side effects ratio Nandrolona D should be administered at a dose of 2 mg per bodyweight weekly. This compound is also popular among women who of course take a much lower dosage, 50 mg per week. Low water retention and other good effects of Nandrolone Decanoatemakes it very suitable for cutting cycles or preparation for show. The most common stack for a cutting cycle is deca and winstrol. Such a stack will provide bodybuilders with a great look of muscularity. Adding steroids like halotestin or trenbolon is a very good idea since it will harden and increase the lever of density to the muscles. Nandrolona D can also be used in bulking cycle with very great results to be expected. The most common stack is Nandrolona D , Dianabol or Testosterone enatat. One can use other, more potent androgens instead of dianabol, for example anadrol 50 or testosterone. In this cases the androgen dosage can be lowered a little making the cycle more tolerable. It is good to continue administering deca for a couple of weeks after the androgen has been stopped in order to hurden up some of the bloat. This should lead to a more quality look of the muscles. Some researches has shown that Nandrolone Decanoate has a progestin activity in the body. The side effects from progesterone are actually very similar to those of estrogen. It can inhibit the production of testosterone, increase the fat storage rate and gynecomastia can occur. As said earlier, Nandrolona D has an effect on endogenous testosterone production. Therefore it is a good idea to use clomid or nolvadex for the pct. Also it may be good to use HCG just to make sure the testes respond to the resumed release of gonadotropins. One can make 3 injections of hcg 2500-5000iu five days apart from eachother. Anti-estrogens should be continued for a couple of weeks after this. It is important to remember that ancciliares should be started few weeks later after the last shot of Nandrolona D has been made because, since it has a very slow activity therefore it stays active for some time.